Nemani Nadolo has called time on his Fiji career at 31. Nemani Nadolo at the 2015 World Cup. 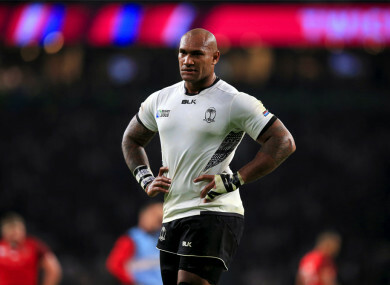 FIJI WINGER NEMANI Nadolo has announced his international retirement, with the Rugby World Cup in Japan on the horizon. The prolific Montpellier flyer, who turns 31 today, revealed he had been contemplating calling time on his Test career for a long time. Nadolo scored 19 tries in 30 matches for the Pacific Islanders, but a defeat to Tonga last June will mark his last appearance on the international stage. He posted on Instagram: “I thought I’d be the first to let you all know that I’ve called it a day playing for my beloved country Fiji. He added: “With the depth and current crop of outside backs coming through I have no doubt that the next ‘caretakers’ of the jersey will do a great job. Email “Fiji to tackle World Cup without Nadolo after winger announces international retirement”. Feedback on “Fiji to tackle World Cup without Nadolo after winger announces international retirement”.